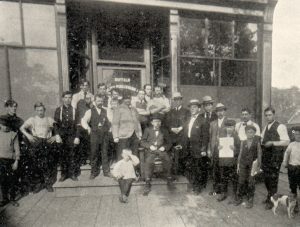 Western New York has had a long history of Polish newspapers. One of the most popular secular papers was the weekly Nowy Wiek. First published on Oct. 4, 1906, by the bookstore owner Jozef Slisz, the paper entered a marketplace dominated by Polak w Ameryce, a publication put out by Father Jan Pitass. The Nowy Wiek would eventually turn into the Dziennik dla Wszystkich by Franciszek Ruszkiewicz and produced by the Everybody’s Daily Publishing Company. Every day the Dziennik reached the tens of thousands of Poles living in Buffalo’s East Side and Black Rock giving them local, regional, national, and international news all in the Polish language. The paper thrived through the 1920s and 1940s. Matthew Pelczynski with editor Alexander Janta would oversee the newspaper through the post war boom, the bust of 1953, and a 1954 labor strike by the Office Employees Union that shut the paper down for two days. From 1954 on, the paper began to slide. One of the first big issues was a decline in the number of people who could read Polish. To deal with this, the paper began to mix articles written in English. But it would not be enough and the paper would fold in 1957. Even though it has been closed for 56 years, the legacy of the Dziennik dla Wszystkich still lives on in the weekly Am-Pol Eagle. Western New York is also a major player in the national Polish print news world with Boston, New York being home to the Polish American Journal.